Even though I’m a terrible cook, I’ve always been a HUGE fan of Rachael Ray. I used to get her magazine and imagine that I could make food as pretty and delicious as hers! I always just adored her sweet, upbeat attitude. At the end of each copy of the magazine, she used to share recipes that you could share with your pets. So when Rachael Ray launched her own line of pet food, I wasn’t really that surprised. I also wasn’t all that surprised to find that she created such high-quality food. My dogs are a big fan of her Nutrish, so I was excited to try out the Nutrish line for cats, a delicious healthy cat food. Now, as you know, cats are a bit more finicky than dogs. Mine are so finicky, I have to keep a list in my purse of brands and flavors that they won’t eat. Recently, we noticed that our cat, Prue, was dropping weight. We had her tested for diabetes (I had a cat go through that before) and that wasn’t the problem. We are pretty sure the problem was that she’s just very picky and didn’t like what we were feeding her! 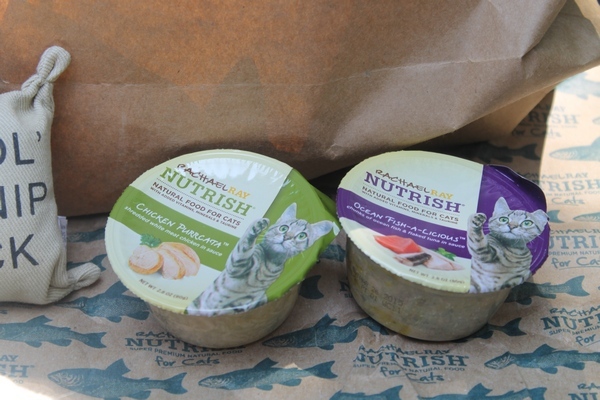 Rachael Ray Nutrish for Cats: Even Your Finickiest Cat will Love it! In an effort to get Prue’s weight back up, we’ve been giving her snacks in between meals. When the Rachael Ray Nutrish package arrived, we let her try it right away. That’s why there are only two in the picture, I actually got three samples! Take a look at just how much Prue loved it. She ate every last bite, then played with the Cat Nip sack after! We also received a bag of Rachael Ray Nutrish Real Salmon & Brown Rice dry food for cats. Now, if you think it’s hard finding wet food your cats will love, try finding the right dry food! I prefer to get natural food for cats as often as possible. We went with several very expensive brands only to watch my cats snub it. I kid you not, I ended up feeding a $30 bag of dry food to the stray cats once because mine wouldn’t eat it. 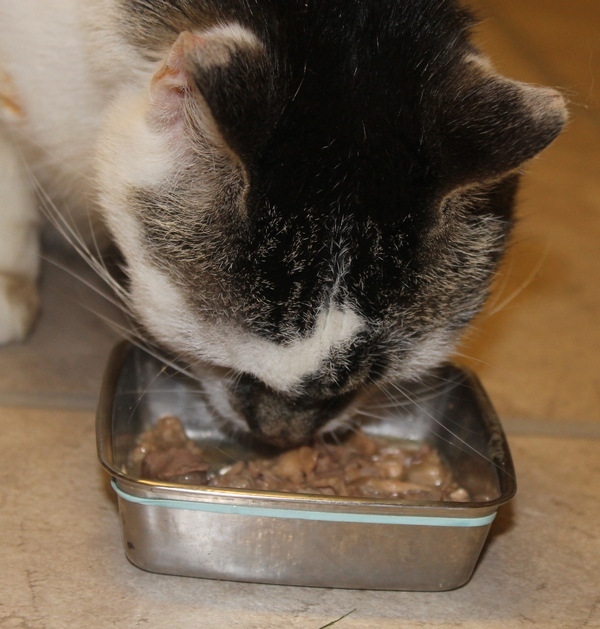 Rachael Ray Nutrish Dry Food is not only natural and nutritious, but my cats actually LOVE it! In fact, we finished up the bag I received and I just went out and bought another one! Rachael Ray Dinner For Two: Chicken for Me, Salmon for You..r cat! 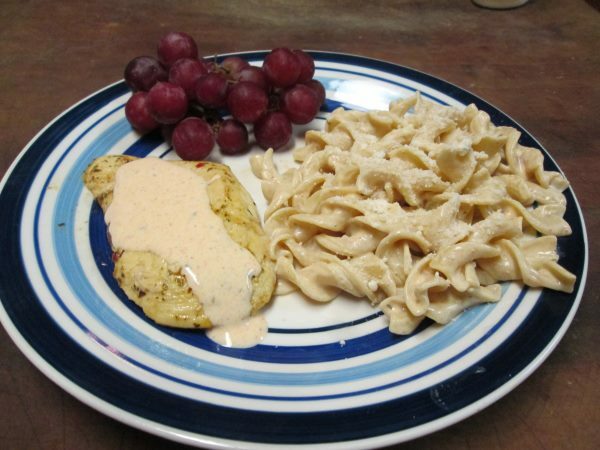 While my cats were enjoying their Salmon dinner, I whipped up my favorite chicken dinner. I love this quick and easy Southwestern Chicken dish. I did receive a great recipe from RachaelRay for her Chicken Teriyaki, but it called for rice and, well, rice freaks me out. Don’t ask why. Boil the noodles according to directions. Saute the chicken in the butter until thoroughly heated. We used some sort of butter and herb mixture. Mix 4 ounces of the Southwestern Chipotle Dip into the noodles. Drizzle some of the dip on the chicken. Why am I sharing a chicken recipe in the middle of a cat food review post? There’s actually a good reason! See, it illustrates the point that the same high-quality ingredients you expect in your own food is found in RachaelRay Nutrish. Ready to try it out with your cat? Grab Nutrish coupons then check the store locator to find out where to buy in your area! Be sure to follow Rachael Ray Nutrish on Facebook, Twitter and Instagram to keep up with news! 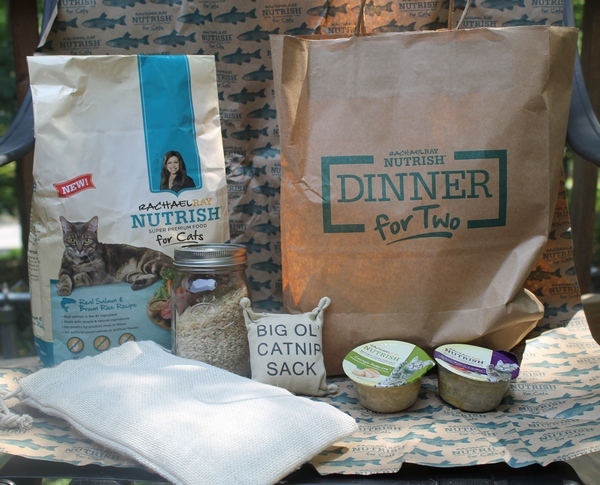 Enter below for a chance to win samples of Rachael Ray Nutrish for Cats! Giveaway is open to US residents age 18+. Contest entrants are only eligible to win once per sweepstake, per household as part of a campaign sponsored by Mom Central Consulting. Giveaway ends 8/17. What flavors do you think your cats would love the most? Are your kitties finicky? They seem to like chicken and salmon the best. Ahh I love the video you shared. They are look so cute while playing..
My cat loves tuna flavor and any fish really. The fishier the better. They love shrimp and tuna flavors best. I like the quality of this cat food line. I’ll bet my babies would like it.